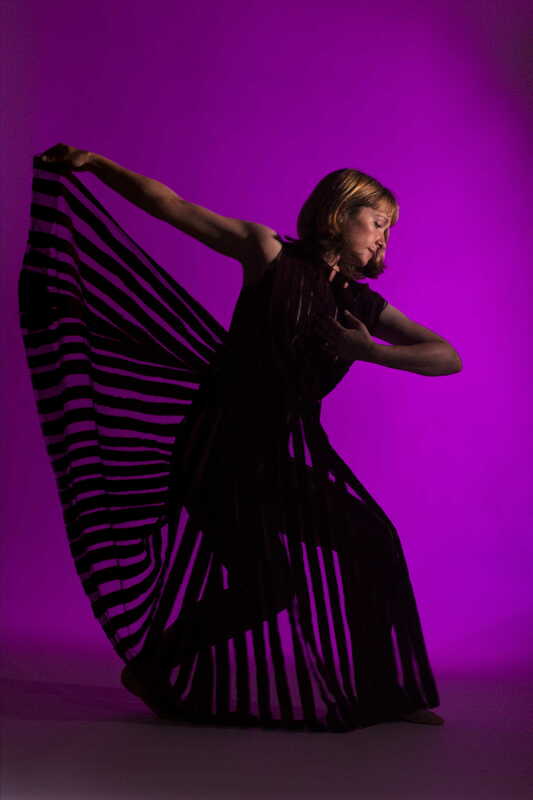 We're a Nottinghamshire (UK) based group of multi media collaborative artists - led by director / composer / dancer / choreographer Isabel Jones since 1992. We bring together both disabled and non disabled artists together, to collaborate and make new contemporary art and socially engaged performance works. …..exploring inspirational healing places in Nottinghamshire……..
Central to the Beeston Lock sound score, developed by composer / soundartist Isabel Jones, we hear music, location recording and live singing alongside stories of wellbeing and resilience, working with seldom heard carers and canalside people who have drawn on challenging lived experience to let nature, breathe space into their daily lives. The Canalside project follows several months of soundart research, connecting to nature and the people who live, work and visit the canal and river. As part of a programme of soundart, yoga and wellbeing work Salamanda Tandem is developing across Nottingham. “Once out there, the performance begins; the sound of birds, the wind in the trees, children at play, the rain, whatever we find, be it soft warm grass, the cold crisp earth of winter, a discarded ball or the common grey squirrel ferreting around. Responding to what the season and each day brings, and the moment. As such resources come into relief, individuals are enveloped in a world of sound and nature. 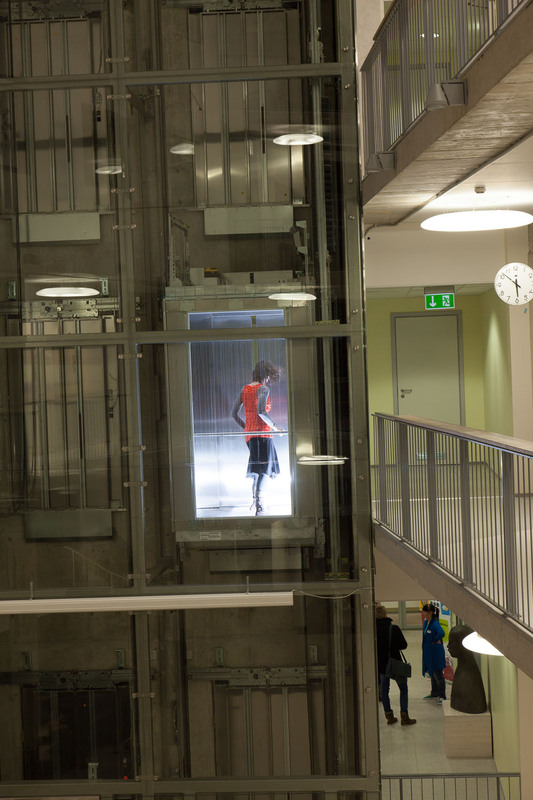 Invited to be absorbed in total concentration for 45 minutes – 1hr duration, audiences move from passive recipients, to ‘actors’ and ‘inventors’ as senses are awakened to the environment unfolding. 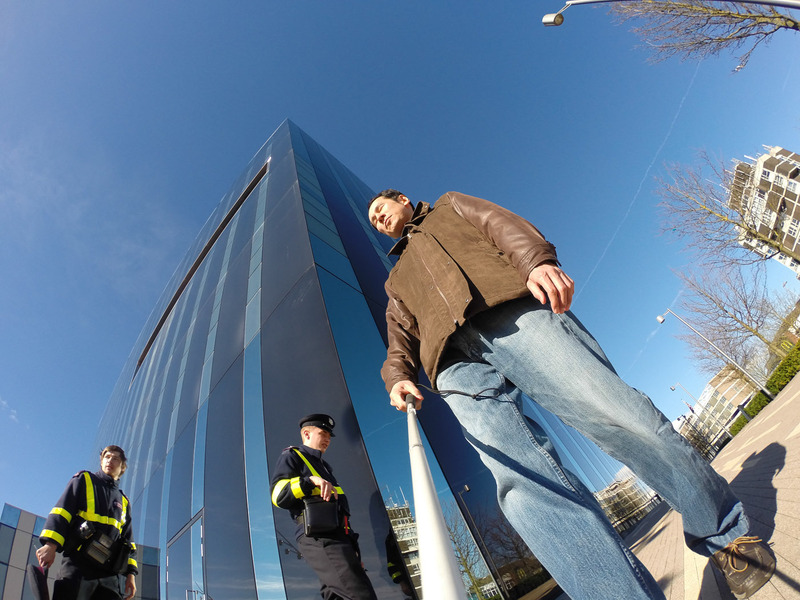 The work utilizes local free resources; the sound and presence of nature, walking, movement, air and breath. Drones, loops, and sine waves are generated live from these natural resources, together with live tabla, and a singer/audio describer who guides audiences to become generators of the performance itself. The soundwalks are designed to lift energies, through cultivating a sense of curiosity, as seldom heard carers, loved ones and friends, tune into the sound, movement and touch of nature, through the healing power of the breath. Our first Soundwalks into wellbeing were designed for our local city park, right opposite Salamanda Tandem’s home studio in West Bridgford, Nottingham, where we ran 4 outdoor soundwalks in autumn 2016, spring 2017, summer 2017 and winter 2018. Soundwalks Into Wellbeing are tailor-made for each season and location; local parks, canalsides, city squares, disused quarry’s, campus’s, nature reserves, fields and walking tracks, in fact any haven for insects, birds, plants, weeds, grasses, water, mammals, bulbs, seeds, and the soil where things grow. As we observe how every part of nature harmoniously responds to the whole; temperature, tides, winds, light, seasonal food, and the movement of the earth, we connect and plug back into the source from which we all come and all depend; learn to breathe, observe, delight in, reflect upon, and give more than we take. 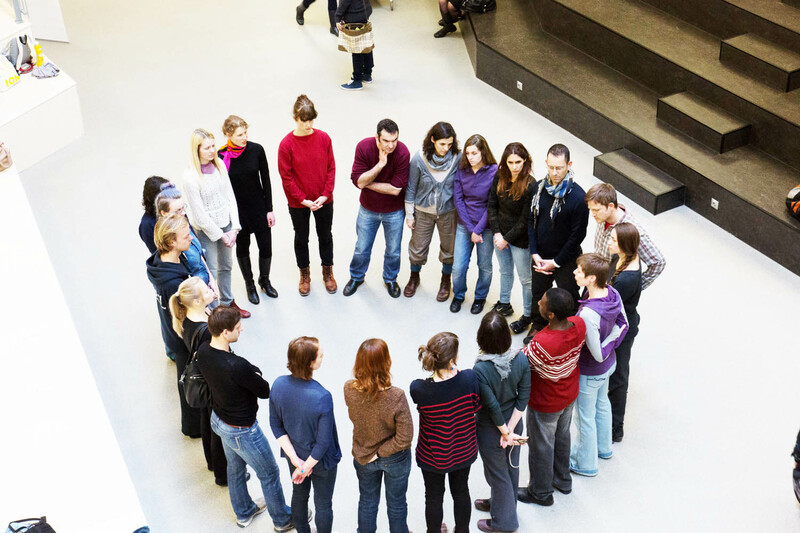 This live headphone participatory experience gives a sense of being on one’s own and simultaneously within a group, where unique and valuable individuals form part of an interdependent whole. Universal connectivity, equally valuable; the mouse, the leaf, the worm, the diverse human being, we are part of, come from and eventually return to the same stuff. This project is part of ‘White Cane’, a series of touring sensory art works developed by a team of blind, visually impaired and sighted musicians who lead audiences into a fascinating world of sonic vision. 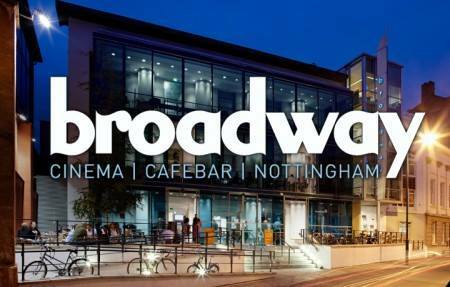 Supported by Nottinghamshire County Council & Arts Council with G4A funding. 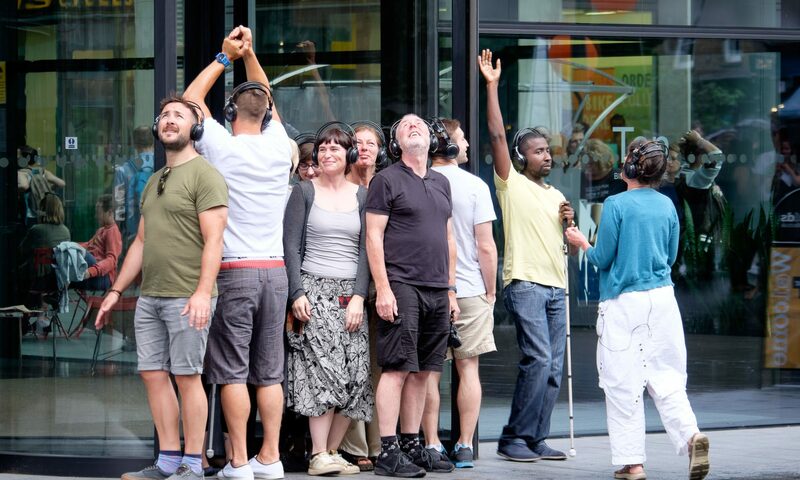 Salamanda Tandem’s ‘Soundwalks into Wellbeing’, are a series of outdoor site specific performances, with radio headphones. Tailor-made for each season, and taking place in our local city park, right opposite Salamanda Tandem’s home in West Bridgford, Nottingham. Designed by soundartists, wellbeing practitioners and seldom heard carers, who collaborate together to develop their own wellbeing, and that of others, to address the challenges of isolation, stress, disability and poor health. “Once out in the park the performance begins; the sound of birds, the wind in the trees, children at play, the rain, whatever we find, be it soft warm grass, the cold crisp earth of winter, a discarded ball or the common grey squirrel ferreting around. Responding to what the season and each day brings, and the moment. As such resources come into relief, individuals are enveloped in a world of sound and nature. Invited to be absorbed in total concentration for the 1hr duration, audiences move from passive recipients, to ‘actors’ and ‘inventors’ as senses are awakened to the environment unfolding. The work utilizes local free resources; the sound and presence of nature, walking, movement, air and breath. Drones, loops, and sine waves are generated live from these natural resources, together with live tabla, and a singer/audio describer who guides audiences to become generators of the performance itself. 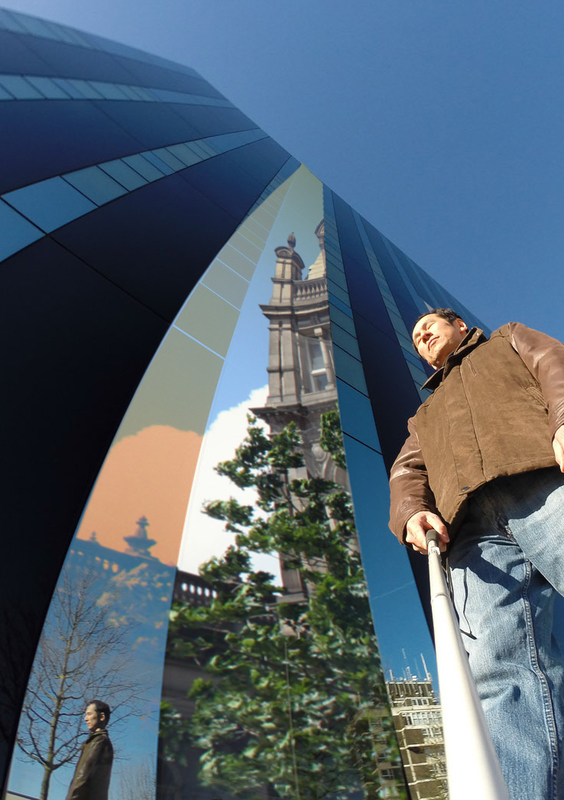 The first soundwalk project, began as part of ‘White Cane’, a series of touring sensory art works developed by a team of blind, visually impaired and sighted musicians who lead audiences into a fascinating world of sonic vision. Supported by Nottinghamshire County Council, Nottinghamshire CC Co-Production Team, Rushcliffe Mental Health carers, & Arts Council G4A funding. On Tour in 2016 with a Composer/Curator award from Sound and Music. “Salamanda Tandem was formed out of a passion to do something about inequality, and about art, by being a catalyst for ‘attitudinal change’. Take movement; ‘Movement is life’ it is the domain of everyone. Movement is vibration, vibration is sound, sound is inside us and all around us. In walking, sitting, lying down, in being still, in performance, in playing, out there on the streets, in the squares, at home, with people of all ages, and in the spaces between. We’ve come up with a ‘Dance’ that realises this sort of potential, a non-divisive ‘Dance’ led by visually impaired people. We’re not ‘perfect’ bodies, we’re interesting bodies yes, but even when our not so perfect bodies are older, we’re still dancing, still sounding the space, still interacting with people. Because the people want to enter this space, it’s inclusive. In a world dominated by sight and movement memory, fashion, transient beauty, bigger, higher, and faster; what happens when a visually impaired, blind, deafblind or profoundly disabled people takes a lead? We find a new dance, a humanitarian growing form practiced between 2 or more people on an equal basis. Looking into the core of ourselves and our society, we’ve always asked questions of who or what has status, who or what is beautiful. We’ve always looked into the art and money we make or don’t make, into what we perceive as valuable, and there our practice begins. The work begins in our own practice and we make it happen in synergy with others, in sustainable co-operation. In that moment when we’re really there in it, our anxieties dissolve and we know it isn’t relevant what we are out in the world. So to make art, music and movement interesting it has to be inclusive, it requires us to inhabit and notice the moment to be awake to that. These sorts of questions have taken Salamanda Tandem into ‘politics’, and the arenas of policy making, advocacy, training, professional education, and research, to yoga, person-centered ways of interacting, and to the heart of our practice and performance. To be a catalyst for attitudinal change, we’ve developed new forms and structures to enable hidden voices to be heard and audiences to expand, from passive recipients to become creators. A belief in equality and it’s enactment. We think of this as attitudinal change, it requires us to re-distribute power, re-configure what we do, how we think and how we behave. 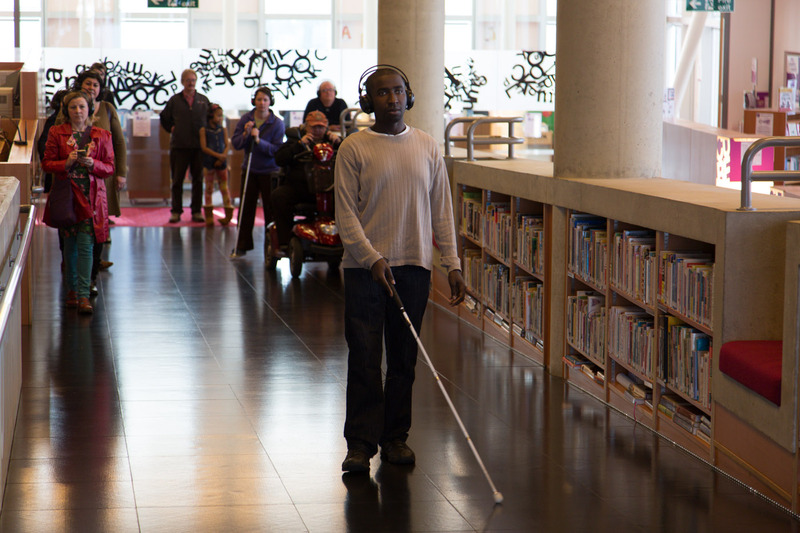 For example; in White Cane, blind and VIP performers become both choreographer and composer as the sound and movement of the long cane user form the cornerstone of the work. In Quarry-os-sion audio description is the art. White Cane received one of the prestigious composer curator awards from Sound and Music to develop a new series of site specific performances touring nationally. Then an arts council grant to actually go on tour! An intriguingly novel way for audiences wearing radio headsets to re-imagine city centre spaces all around the UK, White Cane starts from the vantage point of a visually impaired long cane user’s movement; we hear the ground underneath our feet, sense the shift of air between the buildings, and play with the world around with sung audio description as our guide in performance. White Cane is the latest in a series of performances that Salamanda Tandem has created in collaboration with blind and visually impaired performers exploring perceptions of the world through movement, touch, sound and presence. 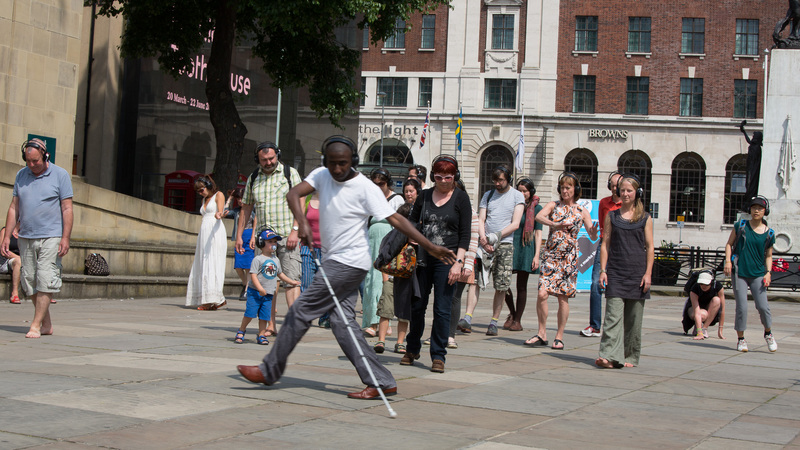 White Cane was originally commissioned by Ludus Festival Leeds July 2014, as the 3rd in a trilogy of new sensory art works started in 2013. Read here. This week we met for a board meeting and something significant happened, we realised we were all Yoga practitioners! And of course so was my father Lewis Jones who was instrumental in Salamanda Tandem’s vision of space inside the body to house the world. Then too, in listing our talented and wonderful associate artists, who essentially are my family I noticed that 80% of those practice or teach yoga. Then I realised that 50% of our artist team are disabled people; sensory experts with a unique perception of things. For some 12 years now Iyengar Yoga, a very special form of rigorous yoga practice, has formed one of the foundation stones of our mental and physical development. 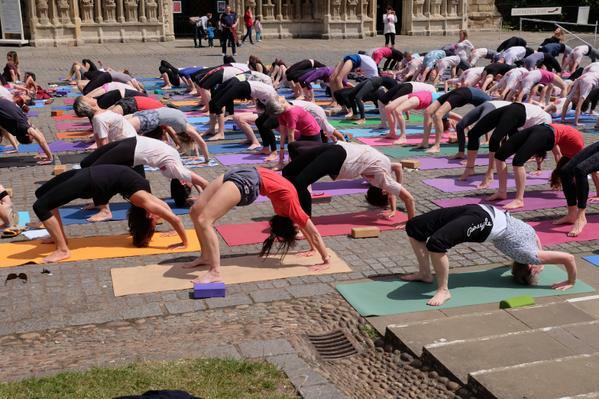 Back in 2002 when I became qualified as an Iyengar yoga teacher we realised that Yoga could help support the physical and mental health of everyone, so we instituted it as a free weekly class for all our associate artists, admin staff, photographers, musicians, dancers etc. We took it on tour with us, and then began to spread outwards into our local community. We now have a small studio at Salamanda Tandem’s base, soon expanding next door, and we teach around 55 students a week in 4 weekly classes, run monthly workshops just round the corner, and lead retreats in the beautiful landscapes of Snowdonia and South Derbyshire for students from all over the country. Yoga Practice, Creativity, Art, Nature and Humanity are all one. Yoga can also be very misunderstood too, it’s as old as the hills but in the west we tend to think of it as some new exercise trend. This week on radio 4 we heard a report on posture; on on the release of chemicals that support feelings of positivity when we stand up straight, then conversely what happens when we collapse. Today we have the science to tell us all this is true, yesterday our ancestors just had their own somatic experience. Get it in your diary and book your tickets now! Takashi Kikushi one of Salamanda Tandem’s performance team. 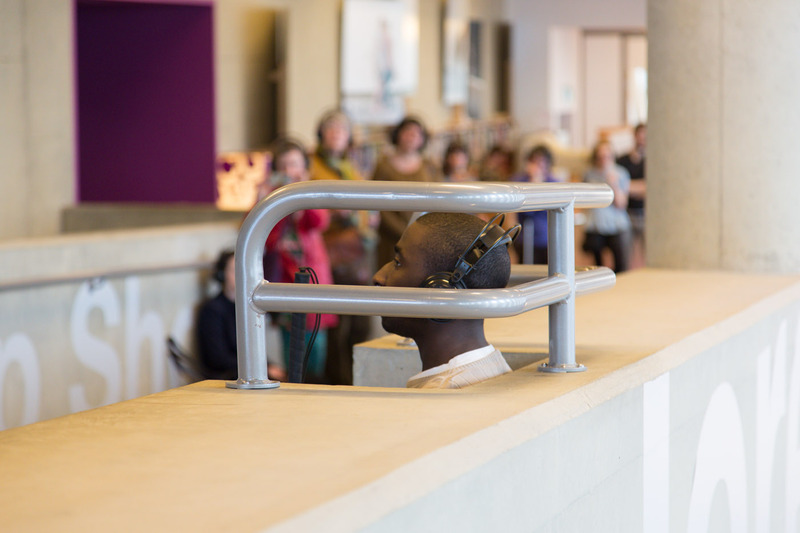 One of the key aspects of White Cane is audio description (AD), this will be transmitted through radio headsets to the general public by co-composers Isabel Jones and Duncan Chapman. Audio description (AD) has recently become available via digital TV, and the major TV channels are now legally obliged to provide it on 20% of their programmes. But it is a complex, challenging, and largely undeveloped form, which can enhance enjoyment (or not) in live performance. Since the very early days of Salamanda Tandem, (est. 1989) we have been exploring this, considering how audio description in rehearsal and performance can make it possible for blind or visually Impaired people to take the leap from passive recipients, to being active creators in the process of making performance. The role of co-director and blind person Lewis Jones was key here for us and we were able to embed the principle very early on in: Smell of The Blue 1992, Subvision 1994, BodyCam 1996, Eye Behind the Eye 1999, Via Crucis 2004 and Touch Talk 2005. Often AD separates visually impaired and blind people from the rest of the audience, transmitting an entirely different experience to them, in White Cane we consider this and explore how performers and audience whether blind, visually impaired or sighted could take the same journey in sound. My father Lewis Jones was a deafblind man and a Welshman who lived in Nottingham for most of his life. He was one of three blind brothers and the co-founder of Salamanda Tandem in 1989. Sadly he died last year. Our work together was profound, and explored the meeting between his inner world of synesthesia and my work as a choreographer, composer and director. Our work together not only influenced me and Salamanda Tandem but also the growth of somatic practice and the field of dance and disabled people internationally. 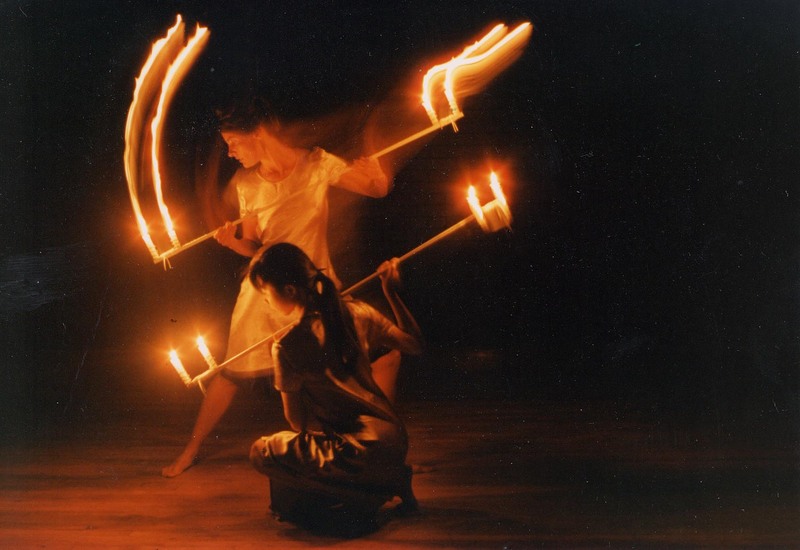 Central for my father Lewis Jones and I in founding Salamanda Tandem, and in directing ‘Eye Contact’ a company of blind, visually impaired and sighted dancers from 1992 – 2006, was to raise the question of ‘equity’. Blind and visually impaired people become accustomed to the idea of being watched by sighted people without reciprocation. Looking could even be understood as a form of touching without the socially unacceptable problems associated with physical contact. ‘Do Not Touch’. A blind person can neither, look or touch in return. Vision is above all other senses the most dominant in society, and it goes for dance too, where accessibility for VIP audiences is rare. For participation too, in an art form where high status is placed in training upon the ability to learn movement via imitation from what we ‘see’ and only a small faction use somatic methods. In such a climate, leadership for people where sight is not their dominant sense, relies on a paradigm shift from inside the artform itself.In our latest works Ad Astra made a the finale of an international symposium in Estonia 2013, and our Touchstone solo exhibition and performances 2013 and 2014, we took this a step further in devising a duet between 2 visually impaired dancers: Mickel Smithen and Indra Slavena who performed independently without sighted partners. 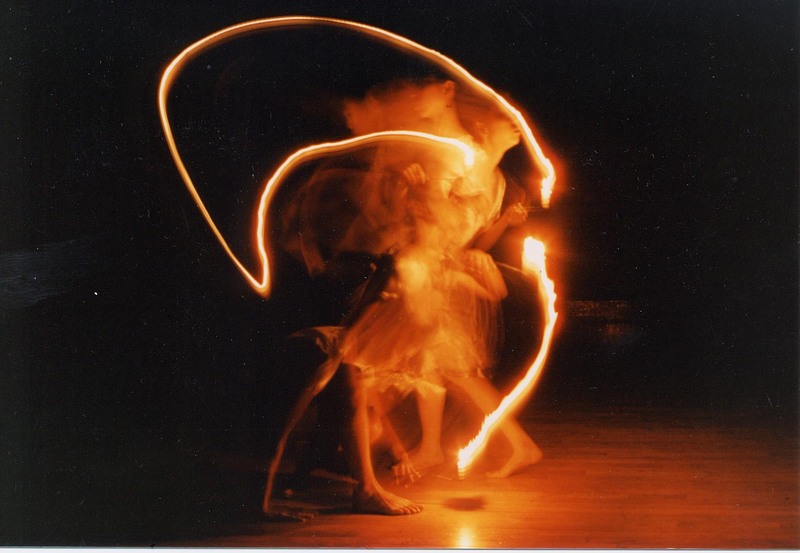 Another innovation came through sound where one of the dancers Indra spoke directly to fellow performers guiding them live through ‘a small dance’ as she had heard Lewis do in SubVision 1994. One of my most important childhood experiences was of observing my father’s extraordinary sensitivity to touch, in handling his white cane and in the flow of movement that followed his mind as he handled a stone or utilitarian object like a cup. It was clear to see the connection between inner mind and outward gesture and I found such beauty and integrity in it. On the other hand, where external visual references are dominant, it is easy to become disconnected. Bombarded with visual information we can just ‘tune out’. This becomes a particular challenge for visual artists and the medium of ‘dance performance’ in particular. In trying to get an audience to ‘tune in’, the choreographer trains their dancers to dance ‘faster, higher and stronger’, leading us towards an often stilted process of rehearsing which can leave us feeling empty too. A body that doesn’t fit the mold is made redundant from such a process; certainly there is no place for a child, non-dancer, disabled, older person or office worker here. Music, sound, then audio description if it exists are put into service for the dance and rarely developed as an integral part of the work. To my mind, these are terrible losses for the field of performance, and a desire to do something about that has become a constant theme in my work over the last 25 years. I’m not the first to discover that if we can focus performance away from the notion of ‘rehearsal’ and more towards ‘spontaneous’ or ‘lived experience’ and be ‘in the moment’ now, we are somewhere closer to bringing audiences and performers together in mutual appreciation. Performance becomes like ‘real life’ and ‘real life’ like performance and we get closer to the very purpose of it. Where the inner imagination meets outer experience is the holy grail of the performer, and ultimately what makes us want to witness it. A theatre or concert hall with its traditional arrangement of seats and stage, require the art work, performer and audience to behave in a certain way; any change from that needs significant effort, whereas in site specific work spontaneity is in the nature of the beast, we simply have to accommodate the possibility. 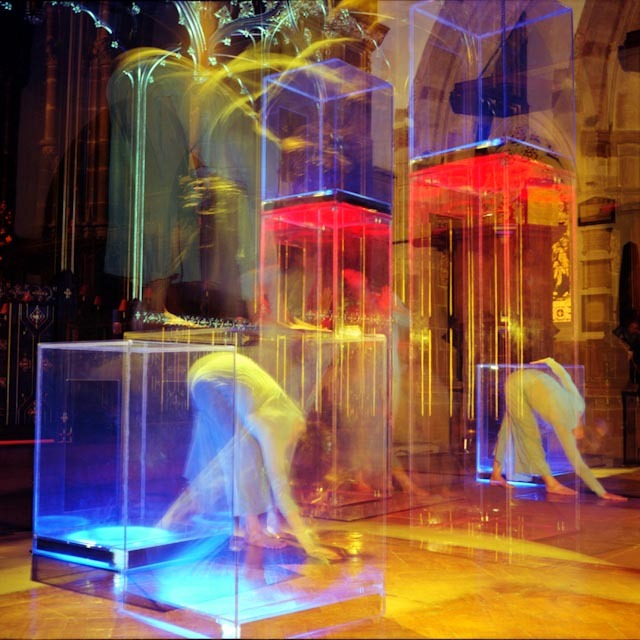 This could happen with light, architecture, people, sound or movement, so if the aesthetic and compositional structure is designed to accommodate that, then each and every performance is significantly different, which keeps the work fresh and energetic which is what I find fascinating. 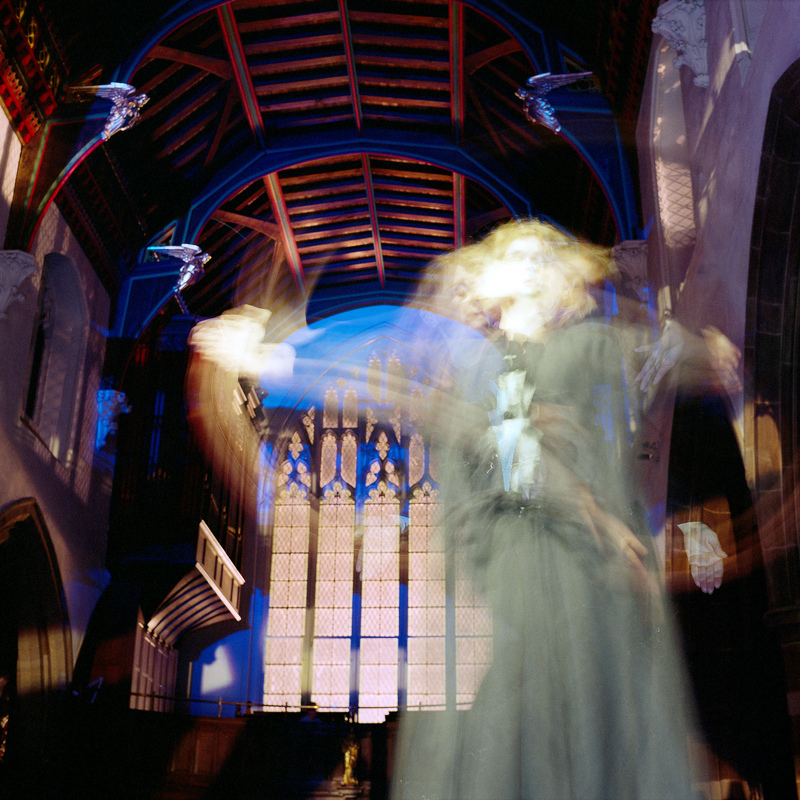 We want to create a work at that involves our audience as part of the performance using sung/spoken audio description and movement, exploring how the ‘onlooker’ as audience or choreographer, meets the ‘looked upon’ as performer or participant. The key to generating a space where both enter the creative frame, leaders/ followers exchange roles meeting through deep sensing, and a kind of mutual gaze supported by sound. We would like to invite you to our opening performance and solo exhibition of Salamanda Tandem’s work, featuring photographs by company photographer and Osteopath Geoffrey Fielding, digital images by Richard Hughes, as well as new music and film from our latest work in Estonia and in the new fascinating building of Corby Cube. The exhibition explores the powerful influence of touch, sonic vision, and environs in our work and the deep collaboration between blind, visually impaired and sighted artists that lies behind Salamanda Tandem’s work and its philosophy. The exhibition includes work made for: Astra Building Tallinn Estonia, Corby Cube, Bretton Hall, Hadley Learning Community, The Water Tower, Shaw’s Quarry Wirksworth, Church Of The Holy Sepulcre Northampton, Lincoln Cathedral, Leicester Cathedral and Nottingham Contemporary. Some examples pictured below. The best show of this year’s Festival! Salamanda Tandem co-composers Isabel Jones and Duncan Chapman lead you into the world of one of Wirksworth’s ancient quarries experimenting with the physical and auditory landscape. 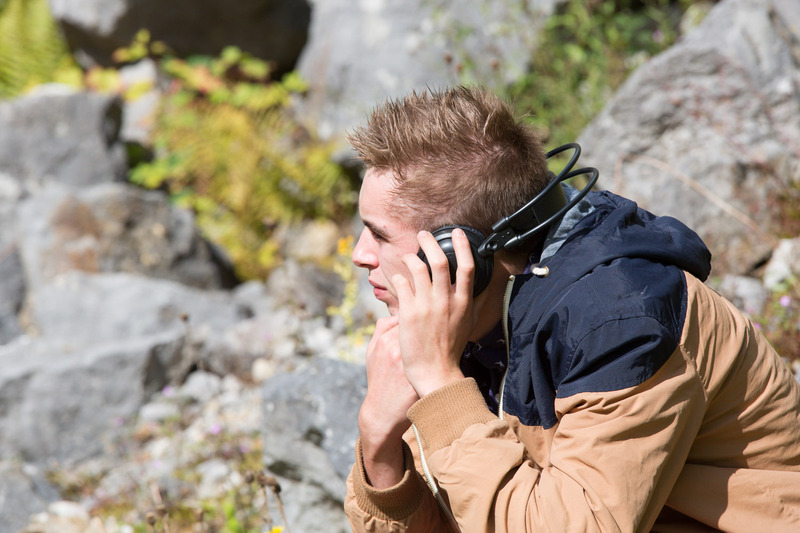 Experience this environment using radio headsets whilst wandering around the quarry, receiving live and recorded sound, awakening perceptions of what is heard, touched and seen in an evocative and sensory art experience. 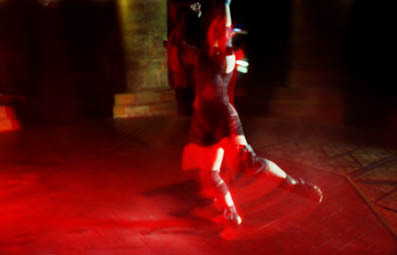 Follow the touch of a visually impaired dancer, the eye of geologist and the ear of 3 musicians. 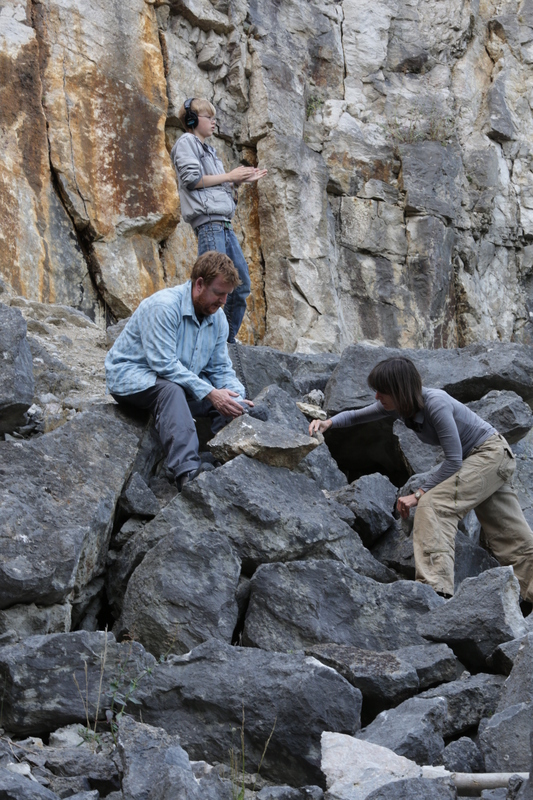 Unfolding over a 4 hour period, visitors are invited to drop in and out, or stay all afternoon to experience the quarry and environs through live performance, audio description, location recording, natural and processed sounds, as well as movement. 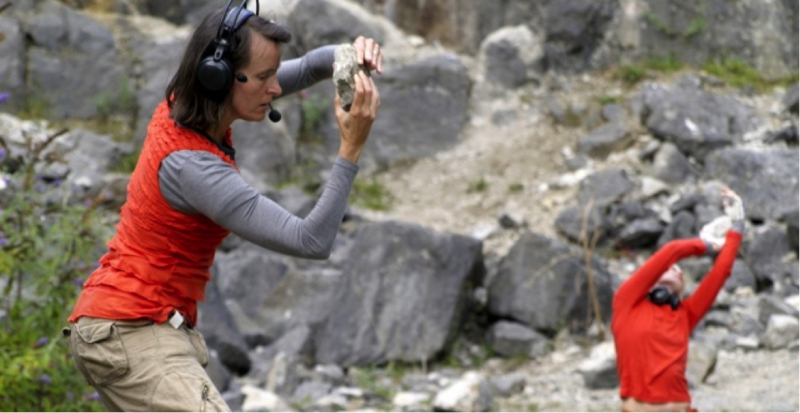 Going on behind scenes is the evolution of a series of acousmatic works exploring stone, rock and slate which will be available during and after this event. 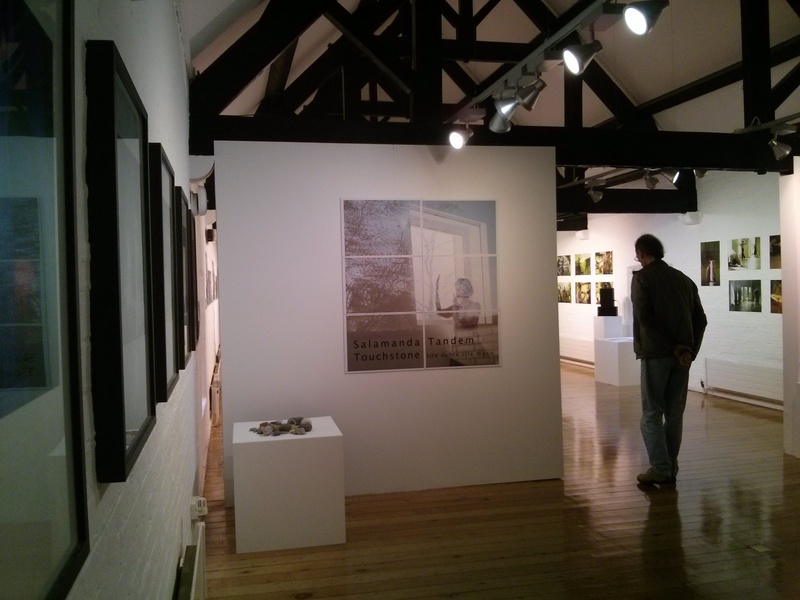 Salamanda Tandem has had a busy, fruitful and fascinating 2013 so far; as guest curator of the Fragile? 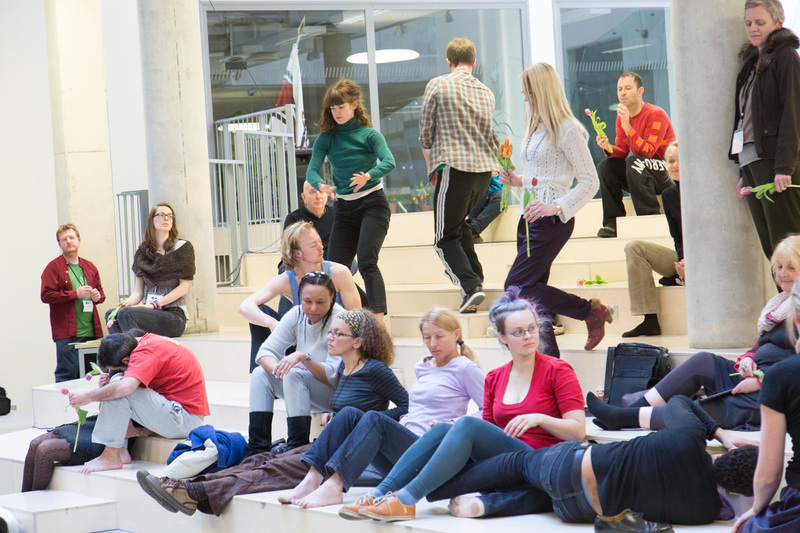 Symposium in Estonia funded by the EU, and as director of the finale performance ‘Ad Astra’ made for 16 dancers, 90 delegates, string quartet and singer, the Symposium attracted over 100 artists, academics and performers internationally in the field of dance and visual impairment. Coming home Salamanda Tandem brought the work to Northamptonshire and performed ‘Ad Astra’ again at The Water Tower, then was then commissioned by Fermynwoods Contemporary Art to develop a new site specific work for Corby called ‘Touchstone’ the work centered in the beautiful Council Chamber at the heart of Corby Cube and was premiered in July 2013. 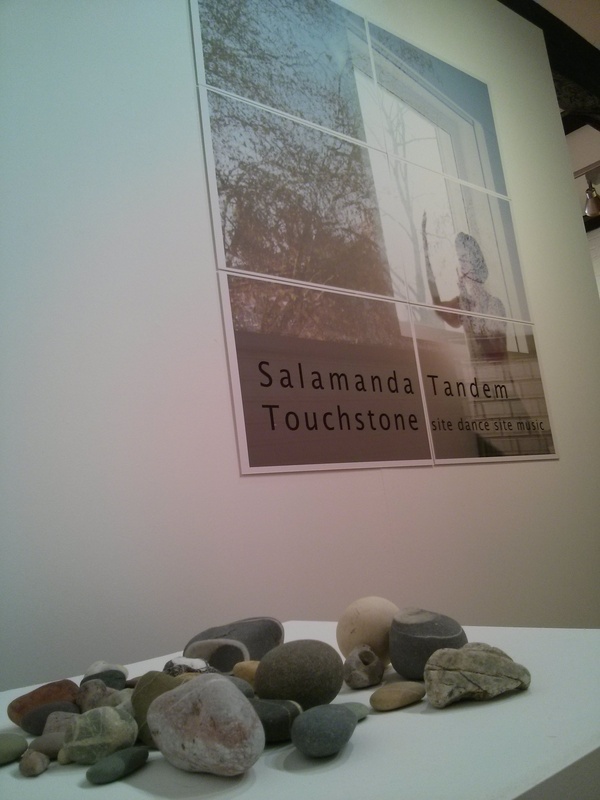 Touchstone is an exhibition, sound installation and film showing the site specific work of Salamanda Tandem and the culmination of an international project focused on the unique creativity of visually impaired people in dance, performance, sound and art presented by inclusive arts organisation salamanda tandem. Designed to celebrate a European wide community of interest and people who share a passion for this work, Ad Astra brings together all the Fragile choreographers and performers. Fragile? contributors and delegates will also be invited to contribute, via a sound score designed especially for this collective performance. Isabel works with Salamanda Tandem colleagues photographer: Geoffrey Fielding, Co-composer Duncan Chapman, performer Mickel Smithen, dancer Indra Slavena, and the Estonian String Quartet ‘Amaroza’ to bring this work to Tallinn. Find a partner to help you get to know the Astra building like a friend. One of you can use sight and the other use touch. Explore Astra and settle in on a place you feel most at home in or are most interested in exploring. Taking turns to follow each other, bring the space to life in your minds eye through touch, and listening. Welcome to the Fragile? symposium set here in the beautiful city of Tallinn. Project partners, Bærum Kulturhus (Norway), Vo’Arte (Portugal), Tallinn University (Estonia) and Salamanda Tandem (England), thank you for joining us to create this European wide gathering of practitioners, participants, artists, and academics, engaged in the fields of dance, art and visual impairment. We aim throughout the Fragile? 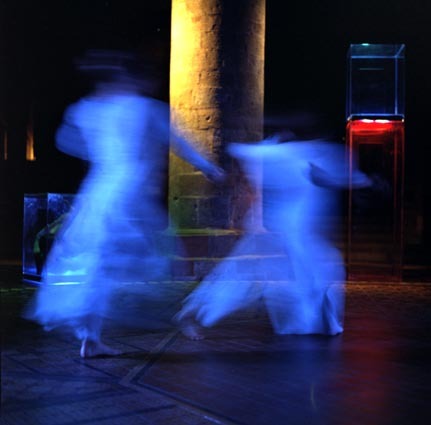 symposium to encourage debate, participation, provocation, and appreciation of the contributions of visually impaired people and their collaborative partners in the fields of dance, performance, wellbeing and art. The symposium programme has been brought together by our Fragile? curator, Isabel Jones, who, in shaping the themes and working closely with partners and contributors, has devised a fascinating event for us consisting of more than 25 separate participatory experiences, inclusive presentations, exhibits and performances. 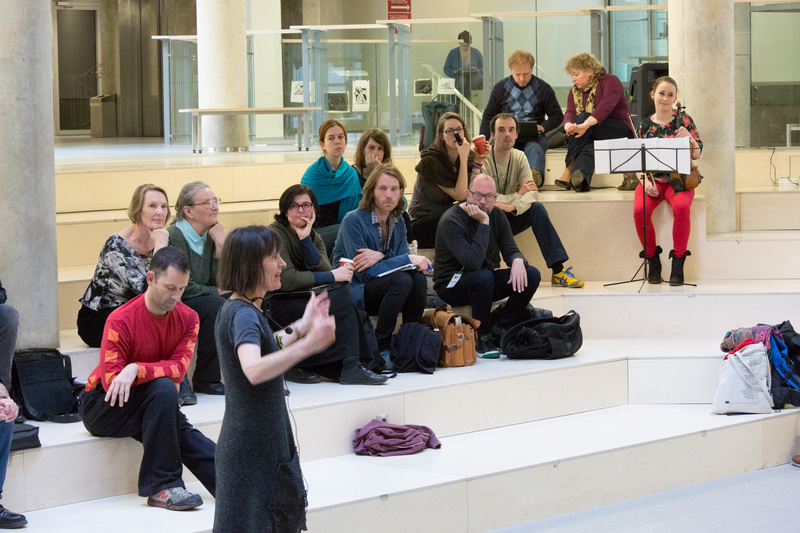 Events will be presented by an exciting array of visually impaired and sighted experts from all over Europe debating, showing, and performing their work in response to the symposium themes. How inclusive is dance as an art form for visually impaired people? What are we doing to make it more so? What affects are there on the ‘Art’ of an inclusive aesthetic? What shifts are needed both attitudinal and physical for visually impaired people to enter the performing arts as professionals? Where, for whom, and how has it been done well? Is dance/art valuable to visually impaired people and, if so, how? How far does this value extend, and does it extend to audiences? Background to the Symposium: Fragile becomes Fragile? 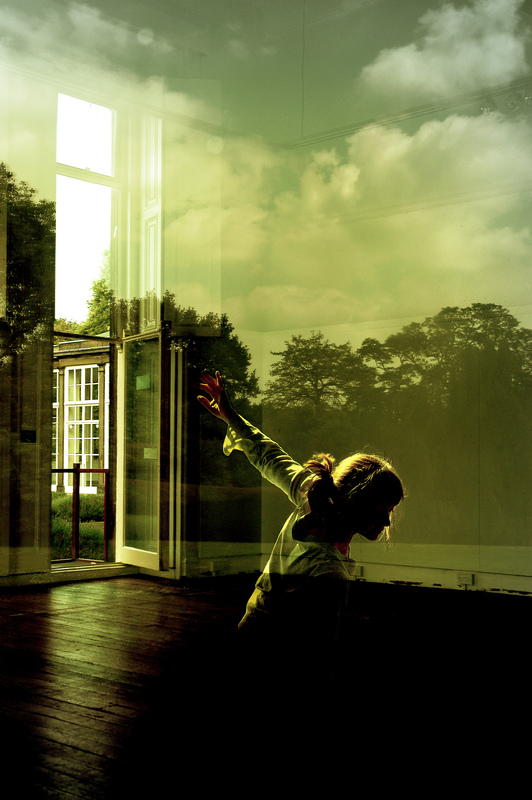 The symposium marks the culmination of a landmark EU funded project, founded by the Norwegian choreographer Kjersti Kramm Engebrigtsen named “Fragile”. Kjersti stimulated by a desire to share her experiences of dance with blind people Europe wide, and the fragility of this work, invited Estonian choreographer Ajjar Ausma and Portuguese choreographer Ana Rita Barata to join her in developing the project. Morten Walderhaug from Bærum Kulturhus (Norway) provided the bedrock of support to raise EU money and bring Vo’Arte (Portugal), Tallinn University (Estonia) and Salamanda Tandem (UK) on board to realise the project. In 2011 Kjersti, Ana Rita and Ajjar started work, supported by project partners and coordinators Marianne Bilger, Clara Antunes and Karmen Ong. Crossing art as well as country borders, the team included composers, costume and lighting designers, and documentary filmmakers from different countries. Local visually impaired people, dance teachers and specialist educators in the field of visual impairment were closely involved whilst, Kjersti, held local workshops in collaboration with Ajjar and Ana Rita in Portugal, Norway and Estonia. The process was designed to anchor the project within local populations in each country, and help develop infrastructure to support the creativity of visually impaired people, through access to professional dancers and choreographers. This work resulted in three new choreographic works: “Touched” (Kjersti K Engebrigsten), “Edge” (Ana Rita Barata) and “Plexus” (Ajjar Ausma). 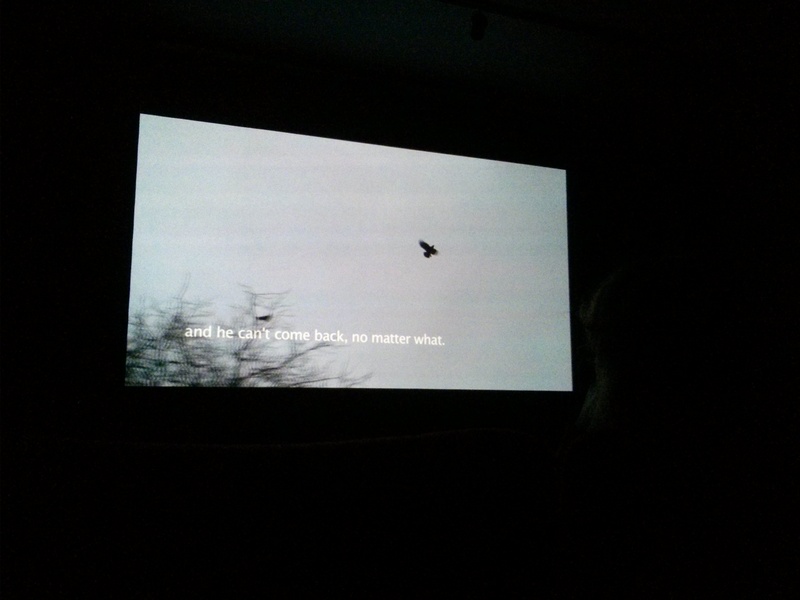 Premiered on 30th March 2013 in Lisbon, then performed in Oslo and now in Tallinn at Kumu. 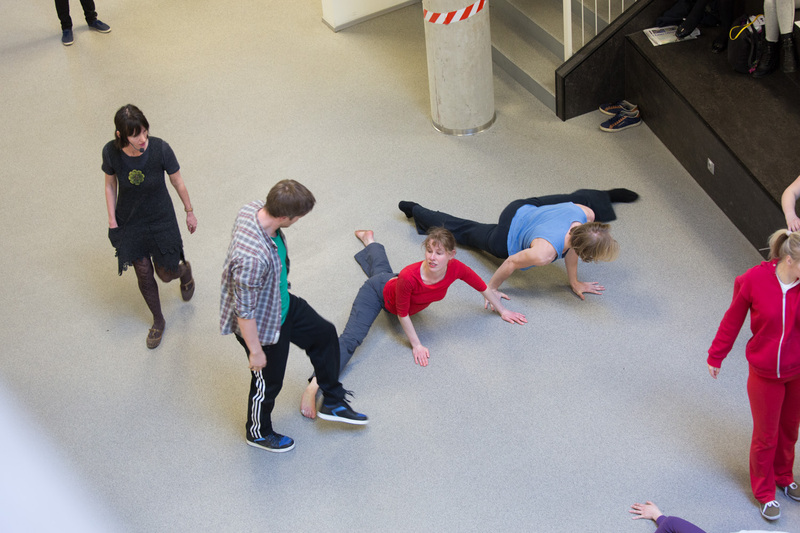 As part of the process Kjersti, Ana and Ajjar invited English choreographer Isabel Jonesto Norway. Inspired by her 30 years of practice and lived experience of the work, she was invited to become curator of this final symposium event to expand the potential of the project to include others. Isabel then introduced a ? suggesting the potential of Fragile? to be a centre for debate and enquiry.